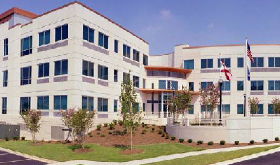 The Federal Bureau of Investigation (FBI) Field Office in Birmingham, Ala., is a 145,360 square-foot facility designed to incorporate the FBI’s security requirements while reflecting the openness and accessibility of the federal government. 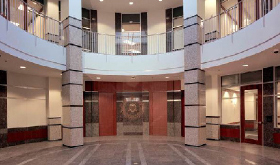 The winner of the 2005 Best Project of the Year for South Central Construction, the composition of the building is executed with detailed granite work and colored pre-cast concrete of a limestone texture. The carved out rotunda in the center of the building creates a dynamic focal point for visitors entering the building. In addition to its development services, US Federal Properties (USFP) partnered with the City of Birmingham to construct $750,000 in additional street improvements, which included new sidewalks, decorative street lighting and landscaping.